In an ever-changing financial landscape, the adoption of a coherent digital strategy is crucial to the customer experience. Customers remain loyal to banks that provide easy-to-use digital products, while any negative interactions, whether on an app or a touchscreen in-branch, can motivate clients to take their business elsewhere. Establishing a digital bank is the simple part – attracting and subsequently keeping customers presents a far greater challenge. In order to satisfy a new generation of tech-savvy consumers who increasingly regard connectivity as a right, not a privilege, banks must formulate a digital strategy capable of adapting to a changing marketplace. In light of these observations, World Finance spoke to Luís Magro, Marketing Director at ActivoBank, to find out more about the changing needs of the digital customer, and how ActivoBank is adapting its strategy to meet the growing demand for streamlined digital products. How can banks make better use of social media? One could almost say that if a brand isn’t present on social media, it doesn’t exist. Research shows more than 60 percent of clients use social media to either seek help or clear up niggling doubts about a service. As such, many companies use social media to address these very issues, responding to customer queries as quickly as possible to ensure their needs are met. But, of course, the most obvious use of social media is advertising one’s products. Social media has great influence when it comes to recommending products to consumers; people make decisions based on what they see and read on social media. Furthermore, engaging with social media gives banks a more intimate knowledge of their customers, providing a priceless insight into the marketplace. How does ActivoBank’s social media strategy differ from that of other banks? Our strategy doesn’t diverge much from the options I’ve previously mentioned: we use social media to advertise our products and answer any customer queries that come our way.For example, we have created an app on Facebook – Facebook Ponto Activo – allowing users to converse with client managers in real time. In order to stay relevant, we also offer information on a broad range of topics, from innovation and entrepreneurship to culture and current affairs. While these subjects may not be bank-related per se, they clearly represent our core values. Topics based around social responsibility – whether financially related or not – tend to gain great traction among our followers. This differs tremendously from what other Portuguese banks are currently doing on social media. Almost everything our competitors post is bank or product-related, with a couple of contests thrown in for good measure. How do Millennials approach banking differently to previous generations? From my experience, Millennials don’t appreciate the tricky banking language deployed by most banks. Instead, they tend to gravitate towards banks offering a simpler, more transparent description of their products. If you want to be successful with Millennials, you must continue to invest in technological solutions and refrain from charging excessive fees for the privilege. Millennials are very digitally independent, and don’t like to pay for services they can conduct themselves. 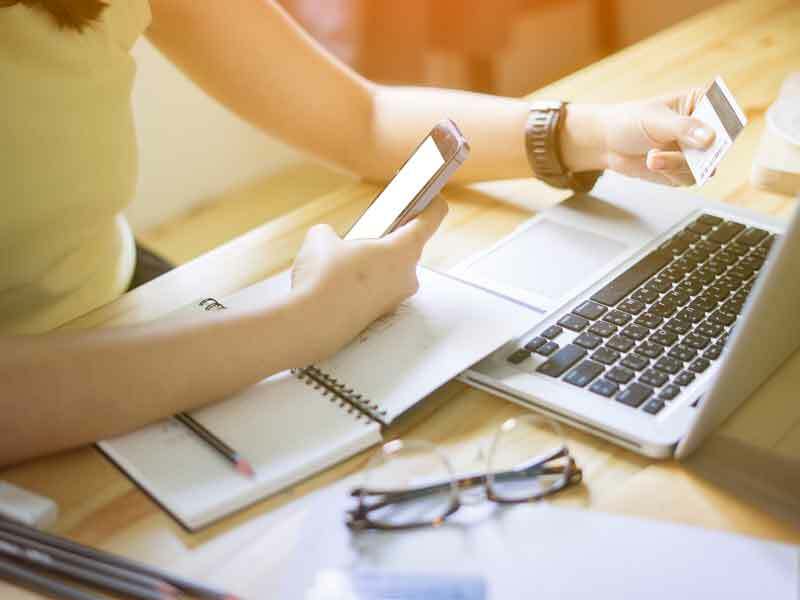 What’s more, Millennials tend to be far less loyal to banks than previous generations; a bad experience either online or on the app can drive users to look elsewhere for their banking needs. Therefore, banking products must adapt to Millennials, not the other way around. 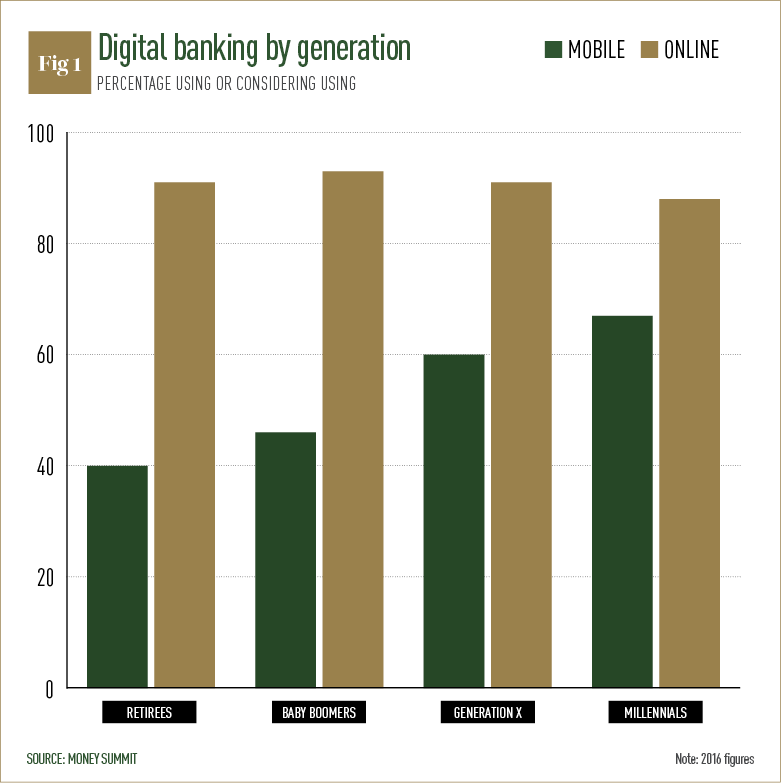 Does digital banking resonate with Millennials more than other generations? Yes, I think it does. When you look at what bank branches used to represent to previous generations and how secondary they’ve become to younger generations, the role of digital banking is obvious. To be fair, a good website can demand the attention of a bank’s entire client base, regardless of age, but apps are a different story – they’re much more likely to be used by younger clients (see Fig 1). I think this is because Millennials are more curious when it comes to any sort of technological innovation – more curious, and less afraid to explore. Given the changing marketplace, are financial institutions willing to take suggestions from clients? While there are some exceptions, most financial institutions aren’t very open to client suggestions. During the financial crisis, people started to openly criticise banks, voicing their distrust more publicly. This, in turn, led banks to make decisions with more secrecy. Simply put, it is increasingly difficult for customers to have their voices heard. However, ActivoBank believes there is a lot to be gained by listening to what people have to say, and we continue to give our customers a voice. Interaction with clients is essential – it shows your customers you are transparent and willing to take responsibility for how you operate. Furthermore, client observations can improve your business. Instead of only using focus groups (which institutions usually pay for), why not engage with clients more directly and gain valuable feedback? By listening to customers, banks can actually redesign products and even create new ones. Taking this approach gives you confidence that your offering is completely in tune with your clients’ needs. In this vein, Facebook is a great medium for gaining a picture of how your bank is being perceived, as people tend to speak more freely on this platform. How is ActivoBank’s digital strategy evolving? We have added some new features to our app and website to make our services more accessible to our customers. For example, we have recently introduced a loan calculator on our app, making it easier for customers to calculate and immediately apply for personal loans online. We are currently working on introducing mortgages to our app as well. While it is already possible to upload some of the necessary documents digitally, we wish to put the entire mortgage application online – simplifying the process completely. That being said, we will continue to offer mortgage support in person and on the phone too. On top of this, we will also allow our customers to open accounts online, no matter where they are. This is a relatively new offering in the digital banking sector, and one we are keen to explore in more depth. In conjunction, we are planning to offer our customers virtual debit and credit cards that can be used in conjunction with near-field communication technology. As a primarily digital bank, we don’t have plans to open many more branches in the future. Instead, we will seek to make our existing branches more efficient, with the installation of holographic bank assistants in each branch. This assistance will initially be based upon a multiple-choice, question-and-answer formula, but we hope, in time, to upgrade this service to be more intuitive. How will these developments help ActivoBank meet the needs of future clients? Whether answering questions or performing transactions, our clients demand we provide services with agility and transparency. The developments I have outlined are essential components of this. How do you think the needs of clients will evolve in the future? A lot has been said about the importance of adopting an omnichannel approach to meet growing and diversifying customer demands. As mentioned previously, customers expect to be able to start any bank transaction on the website, check its status on a smartphone, and go into any branch for further information. They don’t want to spend too much time searching for the right product; they want to feel special, and be offered customised products directly. Achieving the balance between simple, easy-to-explain products and customising them to meet clients’ expectations is difficult, but necessary. The data collected by banks can ultimately help financial institutions strike this balance. Security will also be an issue. Protecting account data and privacy is an obvious requirement of any bank, but clients should be able to trust their bank without having to present an endless number of passwords to access their account. Therefore, investing in alternative forms of authentication, such as biometrics, will continue to be a prerequisite of success. As time goes on, clients will continue to demand more and more from their banks. Their needs will become intertwined with their expectations and desires, and they will expect banks to become more active in the community they’re part of. Clients won’t just be looking for the best products – they’ll choose the most socially responsible, transparent and adaptable bank on the market.